Sorry for the lack of posts yesterday but I came down with some kind of viral flu-ey thing which started out as a headache but turned into an all over ache! :( Thankfully it only lasted 24 hours but I was pretty much in bed for almost the whole day. Anyway thankfully this What I Ate is from the day before so I didn't start to feel rotten until late in the evening. 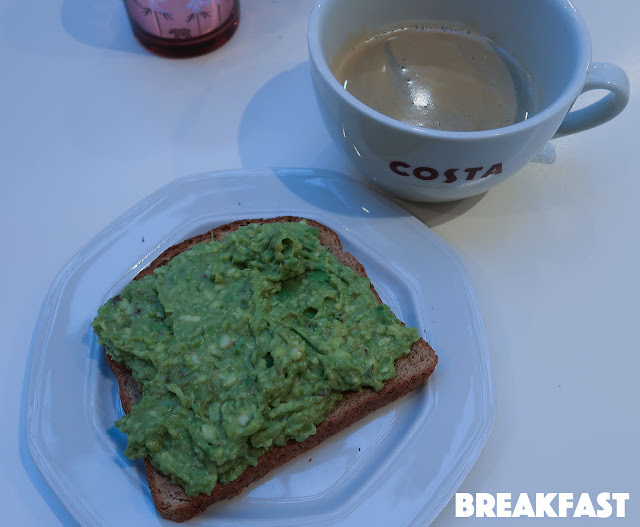 For breakfast I had a slice of wholegrain toast with avocado on top and a black coffee. Basically all I do to make this is take one whole avocado (a big one!) and mash it up with salt & pepper then spread the whole thing on toast and you're done! I also had a bottle of water. We had meetings from 12:30 till 2pm which was rather inconveniently right around lunch time! 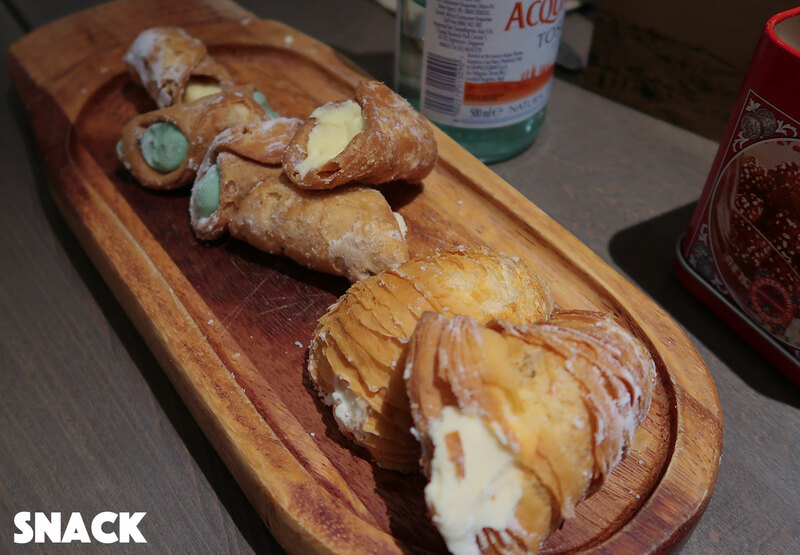 I didn't have time to eat in between them but we did get a plate of Italian pastries (best thing about meeting in an Italian restaurant!) and I had one of the larger two which are called sfogliatelle. They're a flaked pastry filled with cream...yum!! 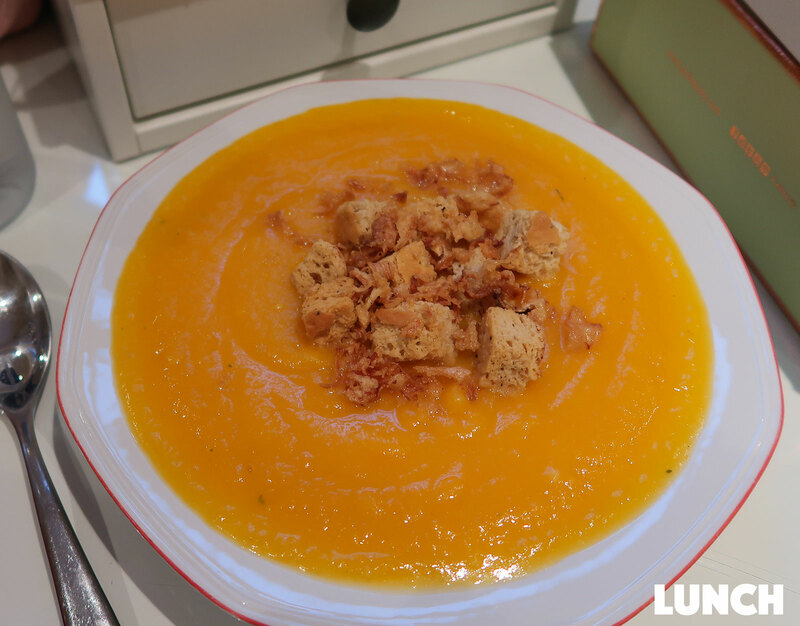 I didn't have lunch till a lot later than usual as we also dropped my sister to the airport but when I got back I had homemade butternut squash soup (made with sweet potato & parsnips) with croutons and fried onions on top. This was actually really filling as I had a massive bowl of it! I also drank another bottle of water. 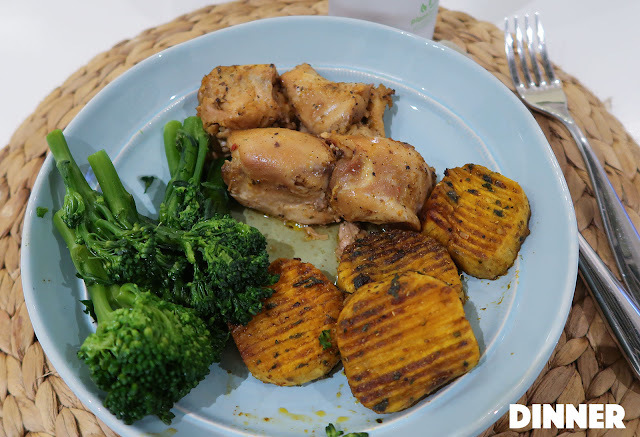 For dinner we had chicken thighs with roasted sweet potato and steamed broccoli. I don't know why but I'm obsessed with sweet potato at the moment! Also broccoli has been a must for me this pregnancy but unfortunately Jonathan doesn't like it so I end up eating most of it myself! (Aside from the little bits I manage to hide in the kids' meals!) Along with dinner I also had a bottle of water. 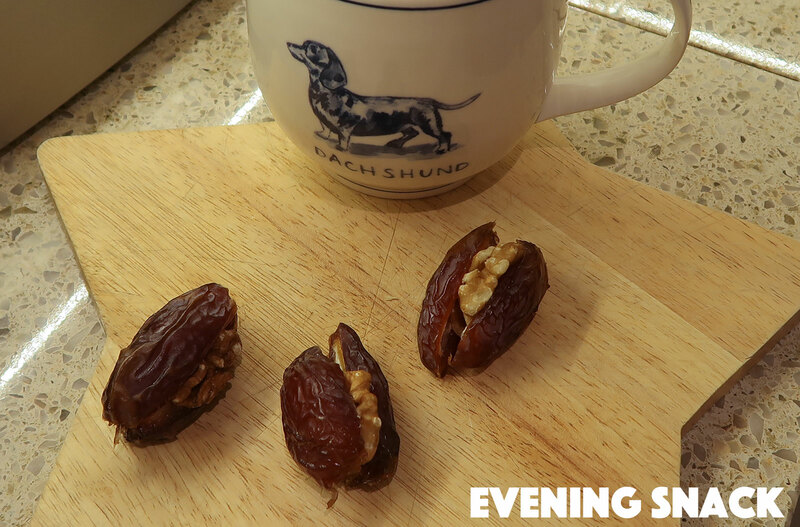 By the time evening rolled round my headache/weird body aches & pains had started :( So I made myself a hot lemon & ginger tea as well as one of my favourite snacks of the moment...some medjool dates stuffed with walnuts. This is a total go-to for curbing a sweet tooth craving yet it's healthy for you! That's everything for this week's What I Ate! Don't forget to check out the vlog above which was introduced by Eduardo talking about his favourite topic of the moment...poo-poo. I really want to make the butternut squash soup. Is there a recipe I can get? Yum! I love that you cook some really delicious healthy meals, but you're also not opposed to treating yourself aswell. 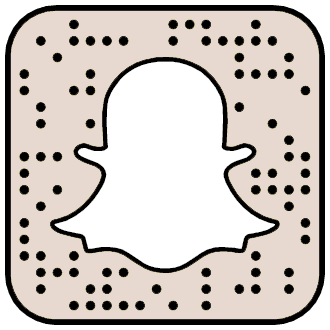 Where do you get your recipes from? Are there any particular books/websites that you like or do you just improvise? I almost fell off my chair when you mentioned the sfogliatella! I prefer the version with the ricotta filling (I think that's the original type of filling? ), my family refers to those as the "clams" and the longer ones with the cream as the "lobster tails". The ricotta ones are much harder to find here in the US, the lobster tail/cream filled are more popular, but the "clam" version is my absolute favorite! This is my first comment here (but I've been watching you and your family for almost 5 years) and I just have to tell you that you look amazing, your skin is perfect, just couldn't stop staring at your face during the video. You are the proof that adult-acne (which I'm suffering too) can be cured. Everyone wants your soup recipe, including me!!! When do you have time to cook such amazing and presentable meals, when you're always always on the go!?!?!?! I'm sorry you were sick, but it's good you are feeling better! 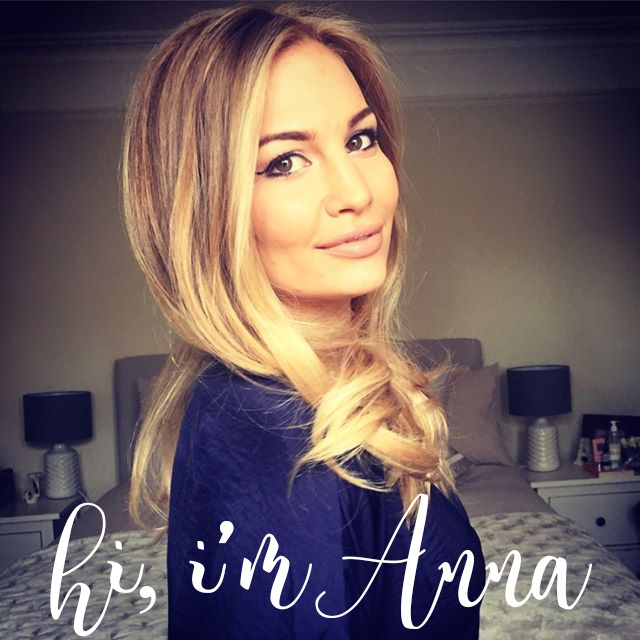 Love you Anna glad to see all the nice healthy food we can all eat. Xxxoooo Ginger from Boston MA. uS.